Q. If you had a magic wand or one wish you could use to conjure up something in a preschool program, care center, or kindergarten, what would that be? The answers give plenty of food for thought. Patrick, dad of K, wishes his son and other kids could learn about gardening and the value of food. It must be the time of year, because just this week there was a radio interview with a scientist and growing food in space. Growing food in space is more than a science challenge. It’s also a mental and emotional issue, as astronauts find they really miss eating something fresh. Plus, being involved in growing food provides a connection nothing else can. Not only do plants feed bodies they also feed our hearts. Caring and looking after plants can reduce the isolation and loneliness of those in space—and back on Earth too. There are so many great reasons to include gardening activities for kids, no wonder Patrick wished kids could have access to gardens. Gardens nourish the senses. Think of the smell of soil and water, green plants, and freshness outdoors. Soft, slippery, wet, and sandy are a few of the different textures for sense of touch. With plants and earth, eyes get lots of stimulation. There’s not a lot to hear, or is there? Perhaps this is one reason why gardening is relaxing, the sounds are oh so quiet. Children not only tune in to their senses, but to their own nature. They also learn about being patient and responsible. The experience the circle of life, in that plants need our care and we need plants for food. Creepy crawlies like worms are part of the connection too. When we care for a garden, we also care for ourselves and others. 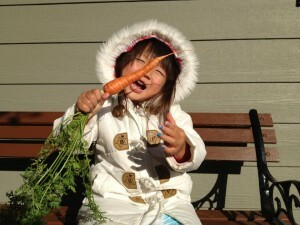 Raising food from planting to harvesting, not only gives kids knowledge of how food grows, but appreciation for it too. In the words of the Guerilla Gardner, Ron Finley, “Kids who grow kale will eat kale. 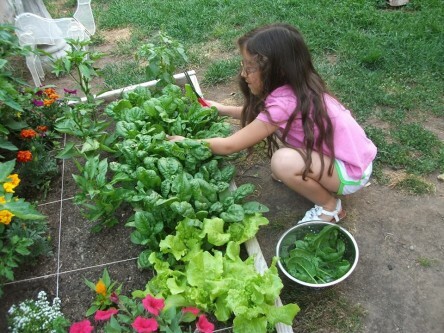 Kids who grow tomatoes, will eat tomatoes.” That’s one way of getting kids to eat veggies. Having kids’ gardening fun and learning as part of early childhood is so worthwhile. Do you wish there was more of it too? The ground and weather may not be warm enough for outside planting, but how about planting inside? 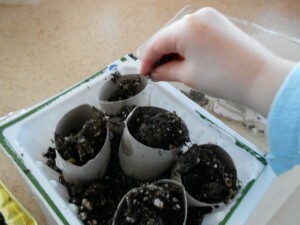 Here’s a planting seeds activity your child can do. Sunflowers, beans, and corn are easy seeds to plant, plus they grow quickly too. Lima beans are nice big seeds. While planting seeds in soil is much easier for later transplanting, it’s really hard to wait even a few days for a sprout to poke up out of the ground. We can’t make soil invisible, but we can use a few different ways so kids can see the sprouts and roots start to grow. Generally, sprouting takes only a few days. The seeds won’t need re-watering very often if at all. Condensation should build up a little on the inside of the bag. Once or perhaps twice a week for more water is usually enough. It’s so exciting to see roots come down and sprouts go up. Talk to your child about these different parts of the plant. Do they look the same? What’s different about them. A cd case is another option for a planting seeds activity. So is a clear plastic cup, although it will require watering more often. If you saved any seeds from carving pumpkins, try a couple of these. Once the seed has sprouted, it can be carefully planted in a cup of dirt and set on a windowsill. In a few weeks, it may be warm enough to be transplanted outside. Isn’t this simple planting seeds activity a great way to connect with nature and for kids to have a hands-on experience with science? A favorite activity in the spring is to plant a bean or other seed. Did you do this growing up and are you doing it now with your children? If you happen to be a Pinterest fan (or addict, like some of us) you will see dozens and dozens of ideas for planting bean seeds. Last year we tried the seed in a ziplock bag and it worked well. 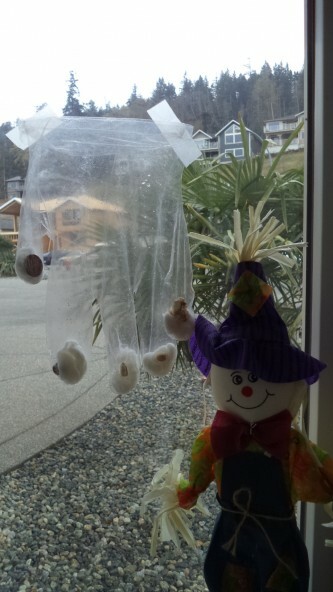 An idea from strongstart.blogspot.com showed a big plastic glove which meant we could plant 5 seeds, or at least 5 different things. and a piece of a cookie like the story Cookie Monster and the Cookie Tree. Close over the top of the bag and tape in a window. The warm spring sun will warm up the seeds and the plastic glove will keep the moisture from the cotton balls recycling inside. It will be easy to see the sprout and roots. One advantage of the glove is that once the baby plant is ready, it should be simple to carefully cut the end of the finger and slide the plant out. If the leaves are too big the plant might need to pushed upwards. If it’s still too cold at night, the plant might be better in a cup or pot until it’s warm enough. We can hardly wait for our seeds to sprout. Maybe, while waiting, we can listen to a story?